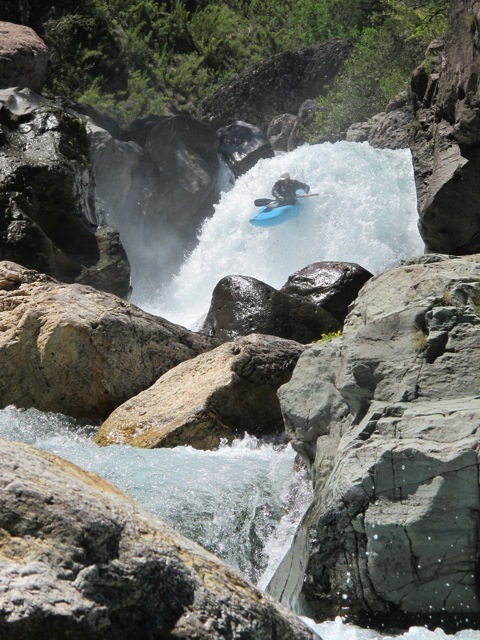 The Rio Las Truchas is one of the few multi-day river trips in Chile and features both outstanding whitewater and spectacular scenery. 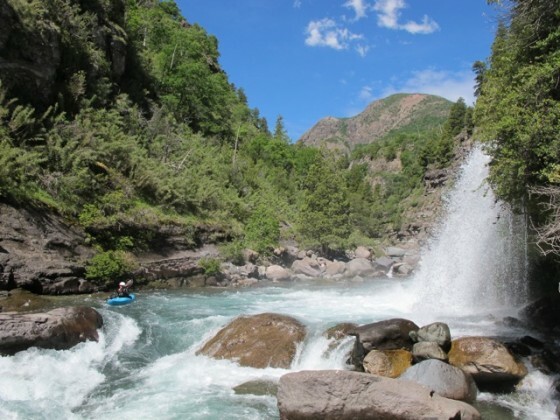 It is an upper tributary of the Ñuble River (see separate description) and needs to be run with spring and early summer snow melt so best from late September to mid/late November with average flow of 10 to 25 Cumecs or 350-800 CFS. 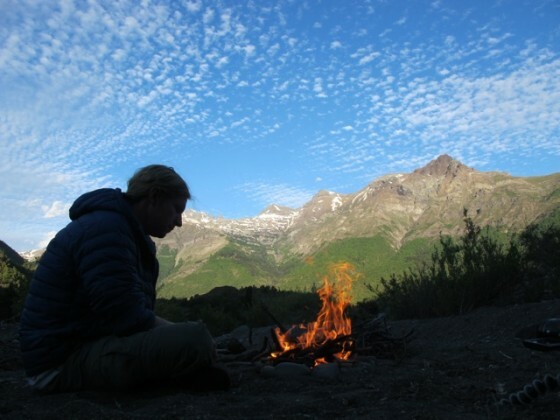 The trip involves an entire day of hiking up to the put in with horses, a full day of paddling down the creek and another full day of paddling out on the Ñuble River (unless a car is left at Los Sauces/Ñuble confluence). There are only a few big rapids, but a day on the Truchas is full of non-stop boulder garden style rapids that will keep you on your toes. I would call this a class 4-5 run, with class 5 consequences due to its remote nature. One of the best parts, is that besides hiring someone to get your boats to the put in, your shuttle involves just a bus ride from the town of San Fabian and then you more or less paddle right back to same town. Arranging the cowboy (huaso) to carry your boats with horses- Contact Pablo Jimenez of Extremo Sur Expediciones at extremosurexpediciones@gmail.com, he is the man who knows all the details of getting the horses set up. His family also has a nice hosteria which is a great spot to base from in San Fabian. The cost for the horses was 30,000 pesos per person. Most likely, the huaso will want to meet you at a beach beside Los Sauces river to start the hike. What this means is that the night before you meet him, you need to catch a bus leaving San Fabian at 5:30pm which will take you up river (or if you have a car drive to Los Sauces) . If on bus tell the driver you want to be dropped off at Los Sauces (this will be about an hour to an hour and a half bus ride from San Fabian). You’ll be dropped by a pedestrian bridge that cross Los Sauces River. Put on and paddle about 10 minutes downstream until you reach a nice beach on your left. You’ll know you’re at the beach because you will have just run a very low volume, junky class 3 rapid which is out of character with rest of river. Camp at the beach and be ready for the huaso to arrive there in the morning. This beach is about 1 KM upstream of the confluence of the Los Sauces River with Ñuble River and elevation approximately 662 meters elevation. Help load your boats on horses and start hiking. The first part of the hike is fairly flat, you’ll be walking up the Upper Ñuble Valley for 8 KM. You will cross a couple small creeks and eventually you will get to the first significant crossing. This is Las Truchas. On our trip we were worried about the water being too low and we were told that if during these crossings (you actually have to cross it twice because it goes around an island at this point) you’re knee deep in water and your legs are burning from the cold at the end then the water level was good. But if you were walking ankle deep in water the whole time it was too low. For us, it was somewhere in between and I’d say our level was on the low side of medium. After these crossings you will get to the small town of El Roble elevation 730 meters. The huaso should wait for you there. This is where you make the only turn of the trip, and have to go through a gate off to the left just after the town. The reason he waits there is to insure that you make the correct turn. After this point he will probably take off with the horses and leave you behind. We made an arrangement with him to leave a white sack on the trail when we got to the spot where we needed to leave the trail and head down to the put-in on the river river. The hike from El Roble to the put in is much more rugged then up to this point. During this section you will cross two big tributaries. the first, or lower, is called Estero del Leon and the second or upper is called Estero de Chureo. After you reach the second tributary you are probably one hour walk to the put-in). The hike took us a full 8 hours. Plan to camp at put-in and begin early the next morning. The put in is about 200 meters below the confluence with the Estero de Los Rabones. It is 12 KM of boating from put in back to Ñuble confluence at El Roble. The average drop in this section is 31 m/km or 155 FPM. 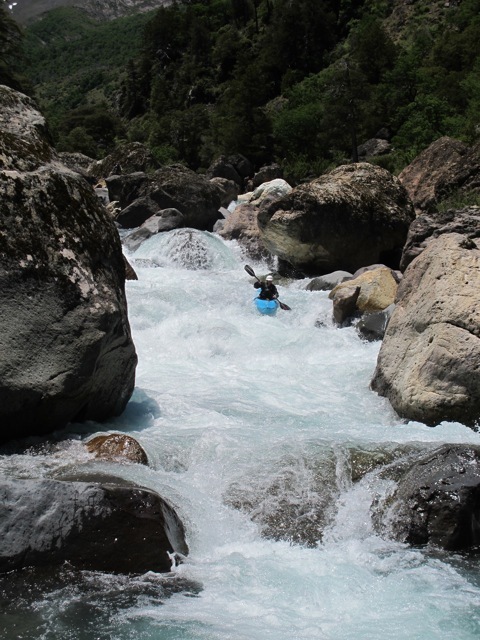 The next 8 KM down the Ñuble to the confluence with Rio Sauces has average gradient of 8.5 m/km or 42.5 FPM which does not sound like much but due to much higher volume there are some surprisingly big rapids. The day on the Truchas took us all day, and involved lots of scouting. Its completely do-able, but don’t underestimate the amount of time it will take you to get down. We probably scouted about 20 rapids and did only one portage. Everything is more or less scoutable. You’ll want to check out the rapids if you can’t see them from your boat as at least at our level there were some manky spots were you wouldn’t want to end up. The rapid we portaged is definitely runnable, but did not seem worth the risk. Portage on a trail on the left. One rapid of note is a 20 foot waterfall that at lower flows has a rock in the center of the landing (turns out my friend who had been here at higher water did not know the rock even existed and they boofed right off the center). At our level boofing the center was not an option. Be aware of this hazard either way. I piton the rock and got lucky I didn’t break my ankles. Not long after you pass the second significant tributary you will arrive at the confluence of the Ñuble where the elevation is approximately 740 meters.. At this point where you camp is up to you. In order to shorten our third and final day, we paddled one more hour downstream (which does include a couple significant rapids on the Ñuble) until the confluence with Los Sauces (elevation at this point is 662 meters). We ended up camping at an awesome spot on the right just after the confluence. The final day involves paddling all the way down the Nuble. This is probably around 20km long and can take anywhere from 4-8 hours depending on where you chose to camp the night before and how fast you move downstream. Take out when you reach a beach on your right just before a vehicle ferry / cable. From here we just jogged back to San Fabian (about a mile) to get someone to come pick us up with our boats. 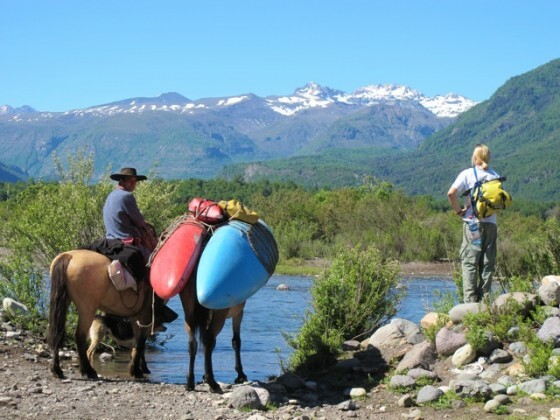 If you need horses to take your kayaks up to las Tragedias, Río Gonzalez, Río la Zorra or Río las Truchas you can contact us ! !